So I have debated back and forth about posting this wonderful update on my stellar day. How honest do I want to get? It came down to this, how am I supposed to share my "journey" with people if I don't share my days that feel like they have a big fat FAIL stamped all over them as well as the days that I soar. So here it goes, my day. Things started out ok this morning. I woke up on time, to my wonderful husband telling me to go back to sleep for the next hour, he would take care of things. When I got out of bed he and my daughters had made me breakfast. That was wonderful. I got the girls ready and dressed, AJ off to school and P-nut and I went to the store. Sounds good so far doesn't it? Yeah, this is where my day starts to fall apart. It shouldn't have been too bad, it was just a quick run in to get some foundation. So in we went. P-nut applying her lip gloss every 5 seconds until I made her put it away. We get to the make-up section and I proceeded to spend the requisite 30 minutes looking at foundations since the one have had been using was no longer in stock. After making a decision we headed to the check out counter. P-nut asked to hold the foundation so that she could help pay, no big deal, the girls do this all the time. When I get to the check-out counter to pay I look down to tell P-nut to put the foundation on the counter and was shocked. She had opened the foundation dumped some in her hand and was licking it. My 3 year old was EATING foundation?!?!?! What? So there is dumb moment number one, but don't you worry, my day wasn't over, there is yet another moment to share. 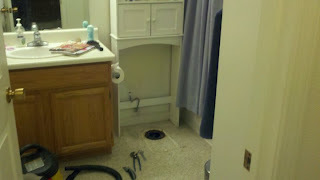 After we got home I went to the bathroom to put the aforementioned foundation away. P-nut followed me to use the facilities. She was flushing as I was putting some things away in the over toilet cabinet, and just my luck things started falling out of the cabinet. So now we have a flushing toilet full of deodorant, contact solution, and eye make-up remover. The remover was just the right size to get flushed down and get stuck. So I did what any Domestic Diva would do and tried to fix the problem myself. I plunged the toilet, I flushed the toilet, I even pushed my sleeves up and tried to stick my hand all the way down the toilet. Nothing worked. So as I sit here at the end of my day, which I am proud to say I finished without a single glass of wine, all I can say is thank goodness tomorrow is another day. 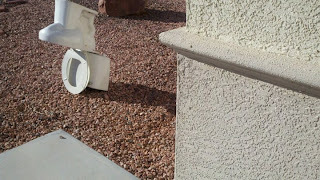 Oh and there is one good thing that came out of this, I got all of the old, stained, moldy caulk removed and replaced. It's the little things in life that make me happy.